Portland Global Initiatives is a registered nonprofit with a mission to increase awareness about global water issues. Portland Global Initiatives endeavors to end the global water crisis through high quality local educational programs and international action. Over the past 8 years our educational programs have performed more than 125 school visits and communicated to more than 4000 Portland area children. Our international actions rely on fundraising events to contribute to clean & safe water projects throughout the developing world. Over the past 5 years we have completed 10 projects throughout the world, providing more than 28,000 people with access to clean and fresh water. Portland Global Initiatives (PGI) is a registered nonprofit with a mission to increase local awareness about global water issues and lead the way in sustainably addressing both the issues and the need. In addition to creating and presenting educational programming for local elementary and middle school classes, PGI holds annual fundraising events to support global water projects. Each year an event is held in honor of UN World Water Day. The board formed in 2010 and gained their 501 (c) 3 status in January of 2011. We all know the essential building blocks of life: food, shelter, clothing, and water. For the most part in Portland these essentials are easilly accesible – but for many in developing countries that simply isn’t the case. All around the world people, mostly young girls, walk miles each day to secure their families’ daily water supply. Nearly one billion people around the world do not have access to clean drinking water and 2.6 billion lack basic sanitation. For Delia, a mother in Honduras, this means a three-mile walk each way to the nearest clean water source. This doesn’t sound like such a difficult task, but the three-mile walk back with a full bucket of water for her family is a true test of endurance. Not only is this an arduous task, but it is time away from education, family, and other pursuits that would help Delia rise to her true potential, thus further maintaining the cycle of poverty. Portland Global Initiatives is comprised of individuals, groups, and companies with a common belief that everyone has a right to the basic necessities: food, shelter, and clean water! We recognize that together we can help bring about meaningful change in parts of the globe that have substantial barriers to everyday living. We can eliminate obstacles that take time away from family, education, and other pursuits that will help break the cycle of poverty. To help accomplish our mission we produce educational programming that is presented to middle and elementary students throughout the region. We also feature volunteer led events each year to raise funds for water projects throughout the developing world. 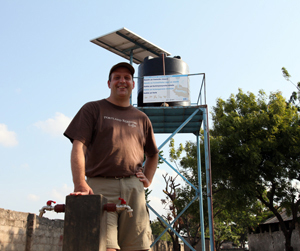 Mark Stell at the Temeke Primary School in Tanzania, just months after a solar-powered well was installed. Mark Stell likes to travel the world in search of growers committed to high-quality coffee. He learned how to determine quality through his early career stint as a roaster and gained management and retail experience as owner of Abruzzi Coffee Roasters, a small Portland company. It wasn’t until opening Portland Roasting Coffee in 1996 that Stell was introduced to the grower component of the coffee business. Once he began his travels to coffee-producing countries, he developed a deep appreciation for the growers and their commitment and love of the land. Mark oversees a staff of 40 and is responsible for green coffee sourcing, purchasing and financial management of the wholesale roaster and green coffee wholesale business. His leadership has earned the company local and national recognition for its business achievements and sustainability initiatives. In 2005, the company won the Specialty Coffee Association of America’s Sustainability Award for its Farm Friendly Direct™ Program, and won Roaster of the Year in 2012. Mark also sits on several boards locally and nationally. He founded Portland Global Initiatives in 2010 to help draw local attention to the global water crisis. When not traveling or managing his team, he retreats with family to his cabin near Mt. Adams and tries to sneak in a fly fishing trip here and there. From 2010 to 2012, Tim operated his own firm, Calderbank Law Offices, P.C., where he concentrated on transactional and litigation matters relating to general business, construction and real estate (both public and private matters), and hospitality. Prior to operating his own firm, Tim spent 2002-2010 as a shareholder with the law firm of Bullivant Houser Bailey, P.C., in its Portland, Oregon office, and from 1997 to 2002 as an associate attorney with the Portland office of Stoel Rives, LLP. Tim maintains an active construction, real estate and hospitality practice providing both business advice and transactional and litigation services for private and public clients, including, but not limited to, insurance companies, general contractors, subcontractors, design professionals, developers, owners, school districts, fire protection districts, coffee roasters, restaurants, and other hospitality vendors. Tim represents these entities in matters relating to defect litigation, public and private contracting, bid disputes, dispute resolutions, licensing and registration, lien/bond claims, and general business advice. Born and raised in Madison, Wisconsin, Brandon moved to Portland in 2001 and is currently a certified public accountant for Mack, Roberts & Company, providing tax and audit services to small businesses and their owners. A couple times in his life he’s taken some professional detours from public accounting, first obtaining a law degree from The John Marshall Law School in Chicago and later working part-time as a sports writer covering the Green Bay Packers for SB Nation. He’s also written about football for the Washington Post online. While not a practicing attorney, Brandon volunteers monthly at the St. Andrew Legal Clinic, helping with the legal needs for low and moderate income families in the Portland area. So when Mark Stell asked Brandon to become a board member in 2010, it fit in perfectly with his interest in providing assistance to people in need, this time helping communities around the world build or repair their basic water systems. Brandon spends his free time with his wife and three young children in SE Portland. He still keeps in touch with his friends from Wisconsin, acting as the Treasurer for the University of Wisconsin alumni chapter in Portland. Creative Director/Director David S. Mayne is an accomplished filmmaker with over 30 years experience. David has created commercials, PBS documentaries, shorts, screenplays, and a feature film. He was a creative director and the sole director at R2C Group in Portland, Oregon. He was one of the first three employees at the start up of that firm and for eight years and helped nurture that company’s growth through many successful award-winning direct response campaigns. Prior to coming to Hawthorne Direct, David ran Very Sirius Productions. A few of David’s noteworthy commercial clients include: AOL, Adidas, Chase, Electrolux, HP, Netscape, iRobot Philips, Sunbeam, Sports Illustrated, Vonage and Goodwill. As an accomplished documentary filmmaker David’s work includes two PBS films, Soleri’s Cities: Architecture For Planet Earth and Beyond, about visionary environmental architect Paolo Soleri, and Taliesin: The Legacy of Frank Lloyd Wright. David is a producer/director/writer for the popular national PBS series History Detectives and was a field producer for the recent PBS program Blueprint America. David’s environmental education theatrical program for the Government of Alberta called Wet Alberta was awarded a prestigious Cine Golden Eagle Award in 2010. David has a lovely wife Susan and two great children, Annika and Flynn who keep him busy having fun when he is not at work. Jay is the inventor of the ubiquitous Java Jacket, and idea he created in 1991. After founding and growing the Java Jacket company, his desire to give back and support those in need around the world has led to support of many great organizations. As a board member at PGI, Jay brings tireless enthusiasm and a sharp business mind to all of our activities and initiatives.